In the 1930's, the United Fruit Company was excavating the fertile, yet remote, farmlands of Costa Rica, near the Diquis Valley on the Pacific Ocean coast. United Fruit is the major importer of bananas and they became interested in this region of Costa Rica because of a blight that had killed many banana trees on the Caribbean coast. 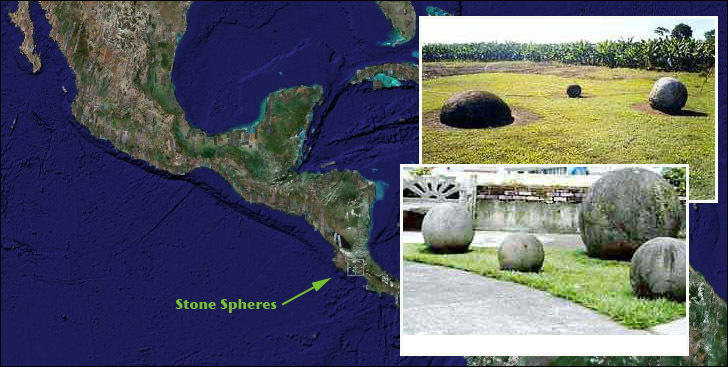 As workers dug and prepared the land for cultivation, they discovered many large stone spheres buried and impaled in the tropical soil. The spheres were previously unknown to the local inhabitants and they could offer no explanation of who made them or how old they were. Plantation workers bulldozed them and largely ignored them until rumors started spreading that they may contain gold or precious jewels. Many balls were drilled or cracked open with dynamite, only to reveal that they were composed of solid rock. When news of these rock balls reached the authorities, several whole specimens and parts of the fractured balls were taken to the National Museum in San Jose. Here, they attracted the attention of Doris Stone, daughter of a United Fruit executive, who photographed them and wrote an article about the phenomenon in the 1943 edition of American Antiquity. Later, Dr. Samuel Lothrop of Harvard University was exploring an unrelated archaeological site in northern Costa Rica and had to cut his "dig" short because of civil unrest in the country. By chance, he met Doris Stone in San Jose, learned about the stones and focused his archaeological studies on the Diquis Delta region, where many more stones were discovered. 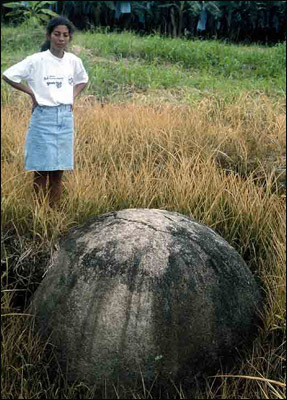 The first formal report of the stone spheres appeared in his published paper, "Archaeology of the Dilquis Delta, Costa Rica 1963." Since then, archaeologists have been perplexed by the stones. Thousands have now been found. Some are as small as four inches -- about the size of a baseball -- while others are a massive eight feet in diameter. Estimates of their age goes back some 1,600 years, yet no one can be sure how they were made, by whom, or why. The spherical stones certainly took a long time to make. The age of these stones places them at a time when no iron tools were known to exist in that region, meaning the spheres were somehow formed by stone implements. Yet no stone tools of this era and geographic area have been found. All of this has lead some researchers to speculate that the stone spheres were made by aliens, a lost civilization and even the people of Atlantis. Some local legends tell of a magic potion that was able to make the rock soften and hence be easily manipulated. This same legend persists to explain other phenomenon such as the precisely carved and fitted stones of Machu Pichu. One legend says that the spheres were formed around a coffee bean or nuggets of gold. Other legends claim that the spheres were part of a game, once played by giants that inhabited the earth, or that the spheres represent stars of constellations in the sky. 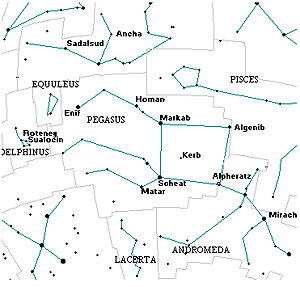 1- M31 Andromeda's galaxy; 2- Mirach (Beta Andromeda); 3- Alpheratz (Alpha Andromeda); 4- Omicron Andromeda; 5- HR8632 in the Lacerta constellation (Yale catalogue of stars); 6- Scheat (Beta Pegasus); 7- Psi Pegasus; 8- Pi Pegasus; 9- Algenib (Gamma Pegasus); 10- Theta, Iota, Lambda, Kappa, Gamma and Omega Pisces; 11- Beta Pisces; 12- Eta Aquarius; 13- Markab (Alpha Pegasus); 14- Homam (Zeta Pegasus); 15- Theta Pegasus; 16- Ancha (Theta Aquarius); 17- Sadalsud (Beta Aquarius); 18- Alpha Equuleus; 19- Enif (Epsilon Pegasus); 20- HR8313 in the Pegasus constellation (Yale catalogue of stars); 21- HR8173 in the Pegasus constellation (Yale catalogue of stars); 22- Delphinus constellation; ?- Figure not yet defined in astronomical context. It is true that the spheres are often found in groups of a dozen to twenty stones and that these groupings have shown to be aligned to North and South. A stone has also been found carved with petroglyphs that have been attributed to stellar constellations, adding to the "un-earthliness" of their origin. Many of the spheres are made of granite like rock. The closest granite quarries of similar rock are in the Talamanca Mountains, some 50 miles away. Although the stones could have been transported down the nearby Terraba River, no unfinished stones or evidence of excavation in the mountains has ever been found. The stone spheres are almost perfect. With some weighing in at almost 32,000 pounds. Obviously some type of mechanical process was needed to form the spherical shape but it is difficult to imagine how they were handled and carved with stone tools to such precision. Also, the region is a dense tropical area with steep terrain, making their movement a task equal to their actual construction. 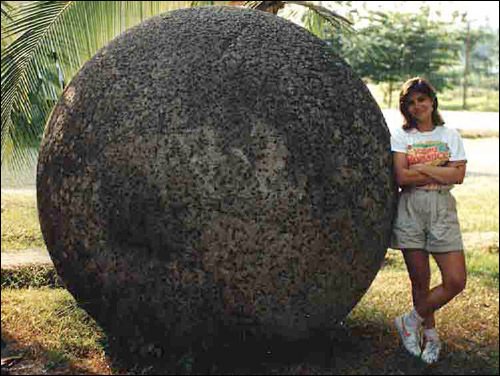 The leading expert on the stone spheres is Ifigenia Quintanilla, a Costa Rican doctoral student at the Universidad Autónoma de Barcelona. She is the author of the book Pre-Columbian Stone Spheres of Costa Rica (2007). The next leading expert is Dr. John Hoopes of the University of Kansas. Dr. Hoopes believes the majority of stones were made by local inhabitants who lived in the area from about 800 to 1200 AD. Because these ancient people had no written language, there is no record of the stones in their history. Dr. Hoopes says the stones were likely formed from granite blocks by successively heating and cooling the outside of the rock, causing it to flake away in layers. Hand tools such as a matate would have been used to refine the spherical shape with sand and leather to finish and polish the surface. The construction of the spheres would have required a high degree of measurement and mathematics. One perplexing question is why this same level of skill and precision has not been found in any other artifacts of this era and region. Dr. Hoopes believes the stones were likely used as a sign of wealth or status, or perhaps in some religious or ceremonial events. But no one knows for sure. Today the stones are in danger. Many are now hoarded by wealthy people for ornaments in their gardens or for curios. The total stones are in the thousands but only 186 can be accounted for in the official records. Often the stones are dug up and moved before any attempt is made to plot their locations or configurations. 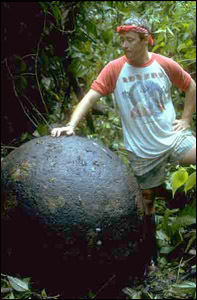 Any future study of the stone spheres of Costa Rica will have to undertaken quickly, before they vanish. Maybe the stone spheres were the Olmecs, if it was the Olmecs , idea of god, they Maybe the stone spheres were the Olmecs, if it was the Olmecs , idea of god, they wanted a symbol for god as they conceived it. Somewhat like the statues of Buddha or of the Hindu gods and goddesses. Also the Greeks thought the sphere symbolized perfection. Not a bad idea, a sphere for god. Were there any step pyramids near by? These spheres are very strange in that they are of all different sizes and some with astral atributes. what If they are a link to the way that energy can be reflected and harnesd by making it resonate at different frequencies. I look at it like an ancient tesla coil. We used to be keepers of light in the 5 th dimension, why can't we make sence of it now. I think we are all operating on the wrong frequency, and not by accident. Our thirst for knowledge gave only a few control thus represing it from all. Back to ViewZone||Comments or Ideas?